Yogurt dips are ideal for parties and family get-togethers. It only takes a few minutes to whip up a tasty dip. Dips can be paired with just about anything, including chips, crackers, and crunchy veggie sticks. If you prefer dips with a little kick, try our recipe for spicy Greek yogurt dip. The recipe makes sixteen servings, which makes it perfect for a party! Additionally, the recipe calls for Sriracha hot sauce, so you know that the dip has a hearty and spicy bite. After trying the recipe, please share it with your friends and family on Facebook, Pinterest and Twitter. We hope they love it as much as we do! Also check out our Greek Yogurt Substitution Guide and all the great benefits you receive by eating Greek Yogurt. Ready to make Sriracha dip? 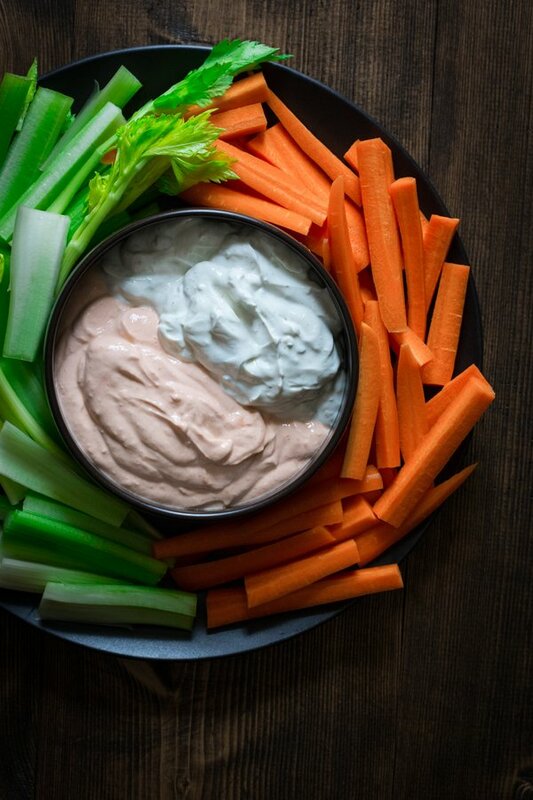 The best thing about this dip is that it features two blue-cheese-based dips—one that’s made with Sriracha, and one that’s plain—that can be served together or blended together to make one deliciously cheesy dip. The recipe calls for plain Greek yogurt, garlic, Sriracha hot sauce, white vinegar, salt, blue cheese, and ground black pepper. In order to make the dip, place your yogurt in a bowl, and toss in the garlic, Sriracha, vinegar and salt. Whisk everything thoroughly. Once the first half is complete, you can make the Sriracha-less dip. Simply combine the remaining yogurt, vinegar, blue cheese, pepper, and salt in another bowl. Once that’s complete, you can serve the two colorful dips side by side. Some people are sensitive to spicy dishes, so having one dip that doesn’t have Sriracha might be appreciated. Additionally, if you’d like to make the dips a little extra cheesy, you can mix them together. Our spicy Greek yogurt dip will undoubtedly be popular at your next party or get-together. 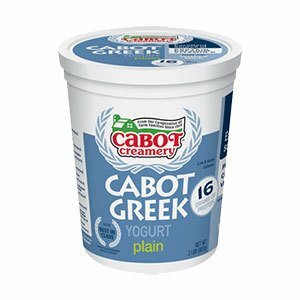 If you enjoyed the recipe and would like to try another Cabot dip, give our BBQ yogurt dip a try. It features the sweet and savory flavors of BBQ sauce with the creamy texture of Greek yogurt. Cabot is a cooperative of 800 farm families. We produce a wide range of award-winning dairy products, ranging from aged cheddar cheeses to Greek yogurts. We understand how important it is to only serve the best to your family at mealtime. After trying our dip recipe, please rate and review it on our website. Let us know if you have any suggestions on improving the recipe too! PLACE 1 cup yogurt in a large bowl. Add garlic, Sriracha, 1 teaspoon white vinegar and ¼ teaspoon salt. Whisk until combined. WHISK the remaining ¾ cup yogurt, the remaining 2 teaspoons vinegar, blue cheese, pepper and the remaining ¼ teaspoon salt in another large bowl. SPOON the two yogurt mixtures into a 2-cup serving bowl and swirl together to make a marbled pattern with a knife. SERVE immediately or cover and refrigerate up to 8 hours in advance.